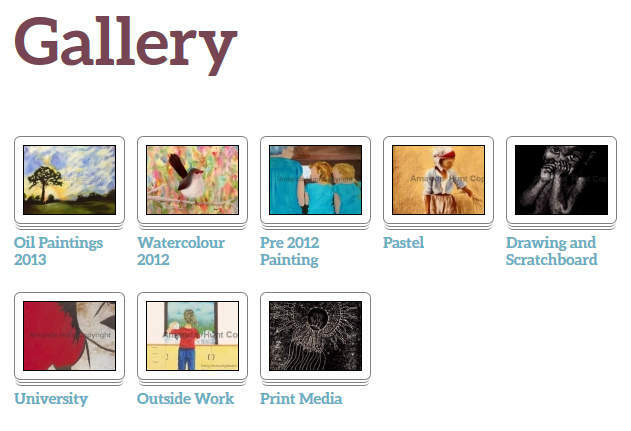 I have spent a good part of the weekend putting together a gallery of my paintings. It was quite a task but was a bit like skipping down memory lane, remembering when and where some of the paintings were created. I’m fairly pleased with the results after finding a good plugin that works fairly easily (NextGen). I have often thought that its only just right now that I am getting started with painting. I often feel as if I have so much to learn still and the picture in my head of where I would like to be is so far out of my reach. Still, I’m quite driven to keep going with it, I can’t help it. Without creativity most days I feel like I’m missing something. Going over old work from way back made me realise that there were actually gems and pieces along the way that were real stepping stones. Themes are also easier to see when you look at it all together. I can see the influence of Africa while I was at uni back in 2002 as it was right after we returned from a year in Niger. I can also see that nature has always been prominent as well as the figure, especially the face. Its been a worthwhile exercise, even if no one else looks at it. At least I can see what I consider progress and after painting and drawing for 20 years I know I’m closer to that picture in my head than ever before.